Beauty Dishes are ideal for creating edgy and crisp light while featuring defined shape yet smooth texture in your subject. Used predominantly in fashion, beauty, and portrait photography, beauty dishes create soft, even light while maintaining texture and contrast. The white reflective surface helps to decrease specularity, helping to even out skin tones. Using the included diffuser sock allows you to soften your light source even more. The Studio Essentials 28” White Beauty Dish is a great option for full-body portraits. Having a larger diameter will allow you to back your light away from your subject and create flattering light with a greater area of coverage. 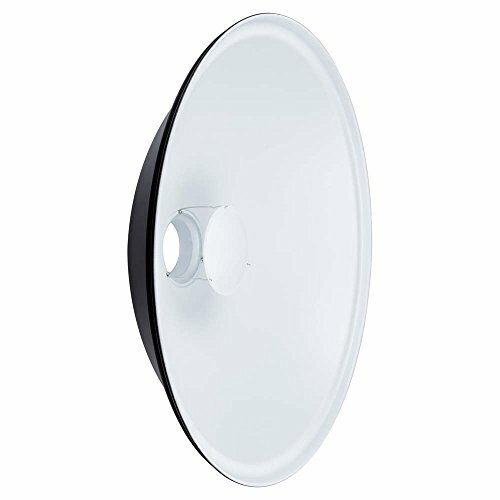 The larger size of this beauty dish makes it a great option for studio use. All Studio Essentials modifiers utilize the widely-used Bowens S-Type mount, making them compatible with all Studio Essentials and Interfit flashes and LED monolights. An optional Honeycomb Grid is an essential add-on to your beauty dish. Honeycomb Grids restrict the spread of light further, adding depth, drama, and stronger shadows to your images.